Mount Assiniboine, also known as Assiniboine Mountain, is a mountain located on the Great Divide, on the British Columbia/Alberta border in Canada.At 3,618 m (11,870 ft), it is the highest peak in the Southern Continental Ranges of the Canadian Rockies. 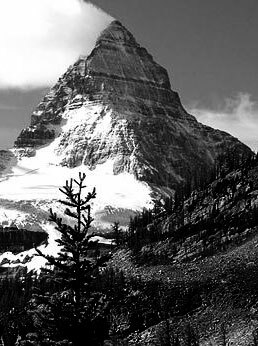 Due to Assiniboine’s pyramidal shape, it has been unofficially named the “Matterhorn” of North America. Mt. Assiniboine rises nearly 1,525 m (5,003 ft) above Lake Magog.